Calista Corporation each year schedules an Annual Meeting of Shareholders. This meeting is crucial because Shareholders elect members to the Board of Directors and vote on any proposed resolutions. 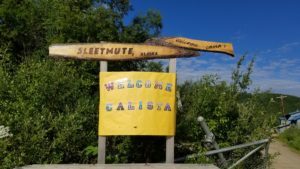 Due to the high cost of travel, annual meetings are generally held throughout the Calista Region in order to reach as many Shareholders as possible. Download a fillable PDF for the Calista Corporation 2019 Shareholder Award Nominations. The Calista Awards are focused on Calista Shareholders and Descendants. Nominations are open to Shareholders and Descendants living in and out of the Calista Region. Each award recipient will receive a plaque and $1,500. Forms must be received by Calista no later than 5pm on Friday, April 12, 2019. All honorees will be announced before the Annual Shareholders Meeting on July 5 in Toksook Bay, Alaska. See more information on Award Nominations. To save over $40,000 and reduce paper use by about 3 tons each year, Annual Meeting Packets are now delivered one per Shareholder household. Each individual voting Shareholder will receive his/her own proxy voting form. Click here for more details on the Annual Meeting Packet Mailing Change, effective 2018. Quorum* must be met in order to conduct a valid meeting. If too few Shareholders vote and quorum is not reached, the Annual Meeting must be rescheduled, which would cost Calista and its Shareholders significant time, effort, and money. Historically, the average Shareholder voting participation of all Annual Meetings is only 50.36%. For the last 6 Annual Meetings, less than 4 in 10 Shareholders 18-39 years old voted. And less than half of Shareholders in their 40s voted. *Calista’s quorum requirement: A majority (more than 50%) of all outstanding shares must be represented in person or by proxy. The Annual Meeting of Shareholders is held at least once every five years in Bethel, and at least once every seven years in Anchorage. The other meetings will be held in villages in the Calista Region selected by the Board of Directors. All proxy votes and ballots are received, verified, and counted by an independent Inspector of Elections. All proxy prize winners are randomly drawn by the Inspector of Elections.